The designation, Model 1884, is somewhat nebulous. The changes that are associated with the model all occurred before or after 1884. For example, the trigger associated with the model is serrated, that change occurred in 1883. Likewise, the Buffington rear sight was not perfected for the gun until 1885. Also, the breech block which is dated "1884" did not appear on guns until 1887. So, there were no obvious changes that occurred with the beginning of 1884. However, the Buffington rear sight is the one item that collectors associate with the model. It should be said that marksmen found the sight to be excellent, but troops found it to be an obstruction. Both the rifle and the carbine can be found with a milled front sight cover or with one of several snap-on covers. 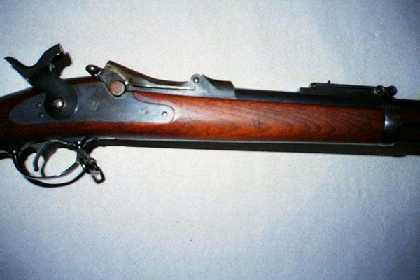 Several versions of the Model 1883 cover were made for the rifle and the carbine. Some were stamped with a letter, ("R" or "C") denoting rifle or carbine, but most were unmarked.